This means of alternative media asks for participation of people in program making, managing and owning the Radio station. Community Radio Stations serves a defined geographic community. Participation at various levels gives the sense of ownership to the people which actually helps the CRS or to say any other organization in its functioning. In case of Community Radio once the organization gets the license it has to look at the revenue generation aspects as it would be the only thing which will make it sustainable the longer run. The term sustainability has been used here for both the meanings first in terms of financial self-sufficiency and sustainability of the programs. Two different but quite successful models of Community Radio Stations in India- the first one is Deccan Development Society’s Radio Sangham at Pastapur village of Medak district, Telangana and second Mumbai University’s campus community radio- MUST Radio have been presented in this study. In India, campus and community run radio stations both are defined as Community Radio Stations. Community Radio Guidelines permit 5 minutes slot for advertisements in one hour of broadcast and a Community Radio Station can get limited sponsorship from Central or state governments and from multilateral agencies. Community Radio Guidelines say that Community Radio Stations would have to follow the All India Radio code of Advertisements- here the question of taking or refusing certain types of advertisements; or from certain types of organizations will definitely depend on the ideology of the organization which is running the Community Radio Station. Secondly, Social Entrepreneurship as an emerging field in the social sector basically caters three factors for one organization to be called as a Social Enterprise- Sociality or Social Value Creation, Innovation and Market Orientation. Sociality is the factor which defines the organization’s mission. Innovation is discussed widely in variety of places including literature related to business, technological or any other type of entrepreneurship. It could be product, process and positioning or paradigm innovation. The two models studied differ in terms of target audience, geographical locations and way of functioning. Deccan Development Society’s Radio Sangham is run by rural dalit women’s collective and hence it clearly shows its social mission of empowering those women. On innovation part the idea itself is new of involving those women whose voices were not taken into consideration even if policies and programs were made for them- Radio Sangham is providing them the platform to raise their voices and to be heard by the community. Mumbai University Student Transmission (MUST Radio) is a Campus Community Radio, with a new organizational structure which comprises of professional radio broadcaster, technician, students and few people from neighboring community. It asks its listeners to come and speak on their radio, provides space to NGOs and other civil society organizations and covers seminars and conferences of the university. And hence the product is also innovative which opens up a new market segment from the target market, and it might become the factor which will give the competitive advantage to MUST Radio. Both of the CRS are using five minutes slot per hour for revenue generation. They also seek sponsorships and funding from different government and non-government sources. This book presents these case studies in detail. 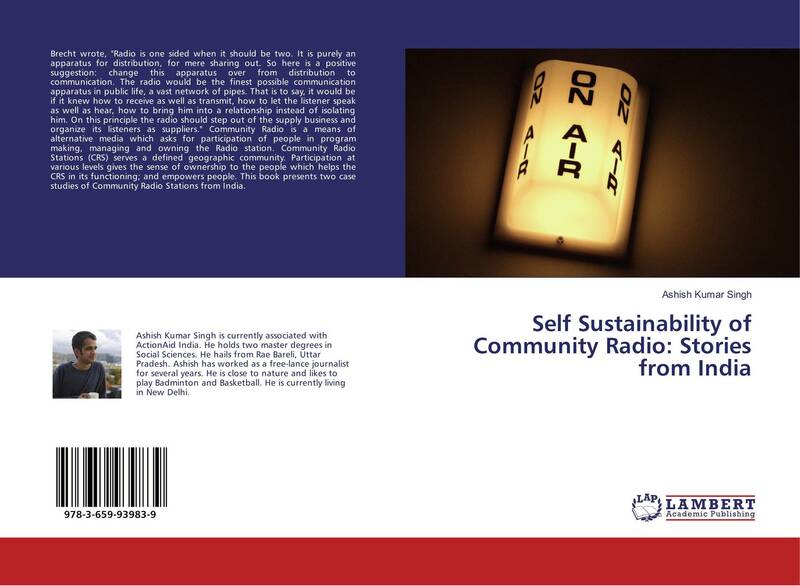 This book is a useful tool for media students, researchers, academicians and civil society organizations interested to understand the current situation of community radio stations in India as examples for social enterprise. Study about community radio is crucial to analyse the benefits of communicatio and women empower women. Common s should also participate and , where are firmskk. ?